The first of today’s guest blogs comes from The Money Charity, a national financial capability charity providing financial education, information and advice to young people & adults throughout the UK. 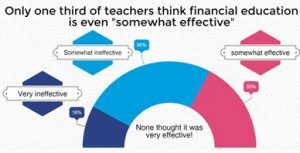 The one pie ce of good news is that nine out of ten schools we surveyed are delivering some kind of financial education. On the face of it a success, but scratch beneath the surface and the picture of financial education does not look so rosy. need to deliver what is an entirely new subject for most teachers.